When I moved to Maine I found there was an active group of guys into G scale railroading. G scale is also called Gauge 1 in the UK, and known as Garden railroading. 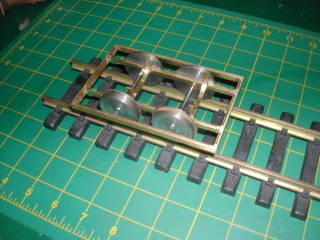 The track gauge is 45mm or about 1 3/4 inches. Some of these guys are into complex layouts built outdoors, with scenery, buildings, etc while others just run live steam engines on elevated, outdoor track. I decided I would build a locomotive model to join in their activities. I talked with the local dealer, Don Jackson, of East Boothbay Central Supply, and after kicking it around he convinced me to try to model LION. I have cursed him many times since, but he is still encouraging me to do it, and has loaned me dozens of books and magazines. He has already modeled a couple of the lumber cars for our LION to pull. 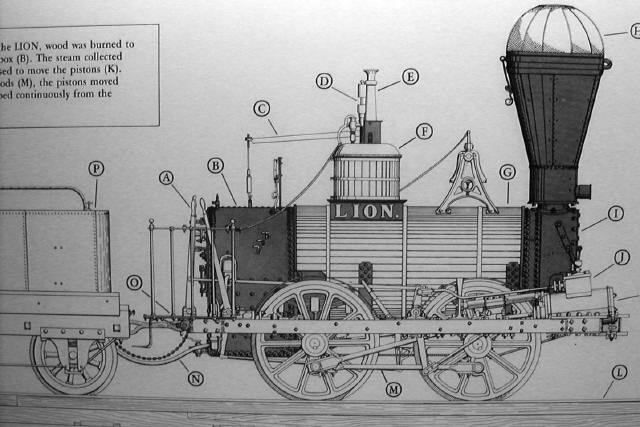 The LION I'm modeling is the one in Maine, not the well known English engine. 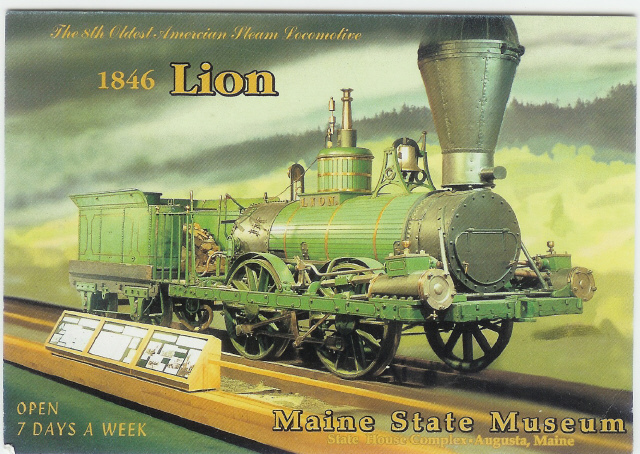 This LION was built in 1846 by Hinkley and Drury in Boston MA, and worked in Machais Maine until 1898 hauling lumber from a sawmill to the docks. It had a partner, TIGER, but when they were sold TIGER was scrapped, but LION was preserved. Over the years it was displayed or stored in various buildings of the university of Maine, In 1986 it was moved to the Maine State Museum in Agusta and given a major restoration. Today LION is the centerpiece display at the museum. A small booklet was prepared and is sold at the museum store with details of the history and restoration work. The following photo is a reproduction of a postcard photo available at the museum store. A nice line drawing ispart of the display and I was able to photograph it. Don and I have made a couple visits to the museum and the staff has allowed us to photograph and measuer the LION. They seem a bit surprised anyone would be interested in this, but have been helpfull. They were able to find some photos and sketches made during the restoration. So I have good information to work with, it should be a simple matter to build a model. The problem is one of scale- 1:32 scale. Altough LION is a standard gauge (4'8 1/2"), it is very small- only 14 ft long overall. This results in a model only about 5 inches long. I am also trying hard to keep this an accurate scale model, so Ive got to cram in a lot of detail. I started the process by using my TurboCAD package to generate some drawings. I took the lines drawing shown above and imported it into a blank drawing. I then used the CAD tools to trace over the major outlines. Once the tracing was complete I deleted the original photo. I then used the dimension tool to measure a known object- the main driving wheel. Since I had the actual dimension of the wheel I could calculate a scale factor and re-scale the entire tracing to full size. Next I worked to clean up this drawing, and rationalize the dimensions. I developed multiple layers and moved each part to a separate layer. I wanted to develop a full 3D model, but my TurboCAD skills are not up to it, and I eventually gave up in frustration.
. The chasis is made of brass sheet, a simple cut notch and silver solder job. 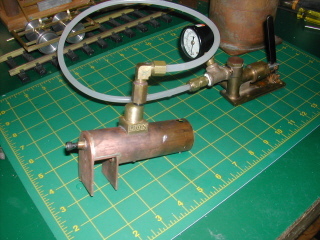 The boiler mounts were a CNC profile job. 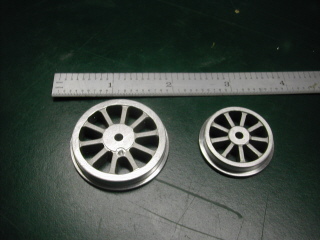 Note at this time I simply have turned steel wheels, the real casting will come later. I made 3 attempts to get a boiler before I settled on a Briggs style (dryback) design. Its all of copper pipe and sheet, all silver brazed together. This photo shows the boiler being hydro tested with a small hand pump. This is a work in progress come back again to see more.